We’d love your help. Let us know what’s wrong with this preview of Portraits of the Mind by Carl Schoonover. Portraits of the Mind follows the fascinating history of our exploration of the brain through images, from medieval sketches and 19th-century drawings by the founder of modern neuroscience to images produced using state-of-the-art techniques, allowing us to see the fantastic networks in the brain as never before. These black-and-white and vibrantly colored images, many res Portraits of the Mind follows the fascinating history of our exploration of the brain through images, from medieval sketches and 19th-century drawings by the founder of modern neuroscience to images produced using state-of-the-art techniques, allowing us to see the fantastic networks in the brain as never before. These black-and-white and vibrantly colored images, many resembling abstract art, are employed daily by scientists around the world, but most have never before been seen by the general public. Each chapter addresses a different set of techniques for studying the brain as revealed through the images, and each is introduced by a leading scientist in that field of study. Author Carl Schoonover’s captions provide detailed explanations of each image as well as the major insights gained by scientists over the course of the past 20 years. Accessible to a wide audience, this book reveals the elegant methods applied to study the mind, giving readers a peek at its innermost workings, helping us to understand them, and offering clues about what may lie ahead. "An odyssey through the brain, illuminated by a rainbow"
"The collection of images in the new book Portraits of the Mind is truly impressive . . . The mix of history, science and art is terrific." "History, science, and art come together to provide a unique perspective on what's going on upstairs." "No knowledge of the source or subject matter of these images is necessary; the book is justified by their beauty alone." "John Keats's insistence that truth is beauty is exemplified by Carl Schoonover's wonderful book Portraits of the Mind. Since one cannot understand the present without examining the past, this book offers a delightful and instructive way of accomplishing just that. I enthusiastically recommend this beautiful book both to students of brain science and to lovers of art." "Portraits of the Mind achieves a rare combination of beauty and knowledge. Its images of the brain are mesmerizing, from medieval engravings to modern visualizations as gorgeously abstract as anything by Rothko or de Kooning. And in explaining the nature of these images, this book also delivers an enlightening, up-to-date history of neuroscience." 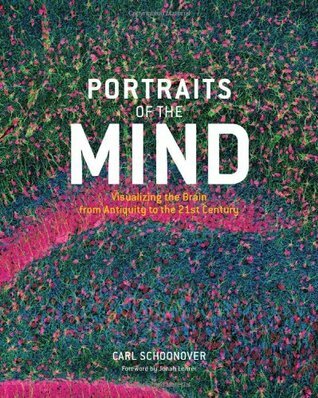 "Portraits of the Mind is a remarkable book that combines beautifully reproduced illustrations of the nervous system as it has been visualized over the centuries, as well as lively and authoritative commentaries by some of today's leading neuroscientists. It will be enjoyed by professionals and general readers alike." To ask other readers questions about Portraits of the Mind, please sign up. Ever Seen A Man's Bwains? Carl Schoonover, a National Science Foundation Graduate Fellow at Columbia University, has provided information and images about the function of the central nervous system that is as fascinating a read as it is a subject. Not one to tackle all aspects of this interesting book, Schoonover has engaged fellow scientists and historians to access the history of the study of the human brain from the Middle Ages to the present. The result is a book brimming with scientific information made readable by the author in the accompanying captions to the many photographs and reproductions of drawings that illuminates the purely scientific writing of the text of the book. The book opens with a well-written introduction and preface by the author who sets us on a journey to experience the ancient beliefs about the brain and the gradual probing of understanding how thoughts are transmitted and how the body works under the governorship of the brain. Beginning with Galen and progressing through Vesalius and Descartes (with some fascinating information on phrenology!) and Golgi, the beginning of Neuroscience as a subject begins the intensive writing and illustrations of Santiago Ramón y Cajal (1852 - 1934), the Spanish histologist, neuroscientist, and Nobel laureate. From here until the end of the book are images now available through electron microscopy, MRI, and other sophisticated forms of imaging that present the art of the central nervous system. After reading the texts, returning to the book becomes an artistic experience as the illustrations are endlessly fascinating. PORTRAITS OF THE MIND is a book that marries science and art and will likely become a part of not only schools of science and medicine, but also schools of art. Very well written and produced, this book is highly recommended for the investigative mind! "Truth is beautiful" - is the leitmotif of this book and I don't think I can describe it better. You do not have to be a scientist to enjoy this book. I came to the book from an artist's perspective and recommend the book to anyone interested in intersections between Art and Science, especially practicing artists in this field. In saying that, none of the images are stand-alone artistic projects.The images in the book are all developed for scientific as oposed to purely aesthetic purposes. You will not find any direct aesthetic or visual arts theory in the book, though its essays and caption You do not have to be a scientist to enjoy this book. I came to the book from an artist's perspective and recommend the book to anyone interested in intersections between Art and Science, especially practicing artists in this field. Beautiful book! It's basically eye-candy for people who enjoy neuroscience. I'm a neuroanatomist and I can tell you that we're pretty under appreciated. ;) I think it's really nice that readers of this book can see the beauty that this type of research can produce. It is a fantastic collection of scientific illustrations of the brain at all scales, from nano to macro. It could be regarded as a wonderful summary of neuroscience history through beautiful pictures. However, I would say it is more than that: the captions contain some of the clearest layman's explanations of some of the most advanced neuroimaging techniques. I consider this book succeeds not only in popularizing neuroscience, but also as an art book, since it contain Art and neuroscience collide! I loved this book. Those who say that science "unweaves the rainbow" (to borrow Dawkin's turn of phrase) and makes the ineffable mundane by means of reductionist explanations need to see this book. An intersection of art and science, an ode to the journey of brains in understanding themselves, it has successfully hijacked my awe response and refused to let go. There is something beautiful about gazing upon an intricate and infinitely complex picture of the human brain and feeling the inexplicabl I loved this book. Those who say that science "unweaves the rainbow" (to borrow Dawkin's turn of phrase) and makes the ineffable mundane by means of reductionist explanations need to see this book. An intersection of art and science, an ode to the journey of brains in understanding themselves, it has successfully hijacked my awe response and refused to let go. There is something beautiful about gazing upon an intricate and infinitely complex picture of the human brain and feeling the inexplicable longing for order, pattern and understanding. The explanations succinctly detail the history of our understanding of the brain through a series of beautiful illustrations. This book is appropriate to laymen with highschool knowledge of chemistry/biology and does not require a great deal of knowledge to be appreciated, although those versed in neuroscience will likely learn something new as well. Engaging, enthralling and at no point dry, it highlights the pure joy and beauty of scientific discovery. Another book I took out of the library for its illustrations--from drawings of the brain as imagined by Galen in the 2nd century to the latest brain-imaging technology, Schoonover provides a visual feast. The complexity of the brain is well-documented; still, though much progress has been made in the last 100 years in the mapping and understanding of how information travels in the brain, the amount that remains to be discovered about brain function is layers deeper. And though MRIs and microscop Another book I took out of the library for its illustrations--from drawings of the brain as imagined by Galen in the 2nd century to the latest brain-imaging technology, Schoonover provides a visual feast. The complexity of the brain is well-documented; still, though much progress has been made in the last 100 years in the mapping and understanding of how information travels in the brain, the amount that remains to be discovered about brain function is layers deeper. And though MRIs and microscopy can certainly be dazzling and often have an eerie resemblance to abstract art, the drawings made by early scientists have a delicate, stark, and moving beauty that machines cannot replicate for me. There's a lot of information packed into this book, and it is accompanied by beautiful glossy images. as the title and subtitle suggest, this little gem of a book discusses all known forms of brain imaging or visualization of the brain, from the past (such as phrenology) to the present (fMRI, EEG, MRI, etc.). I found it a JOY to read, but then again, I do like brains! This would be a great supplement to anyone's education in neurology or psychology, and is a great piece for a library. Awesome and maddening. Maddeningly awesome. It's sort of like taking a docent-led tour of a neuroscience museum / exploratorium. There are a lot of incredibly intriguing images and tidbits and caption fragments, but then you are basically left hanging if you desire to actually understand the figures and methods, rather than simply to enjoy them aesthetically. Still, I've never seen anything else like this, and I admire the motivation behind it and the curatorial skill. Loved this book. The images were beautiful (frame-it-and-put-it-on-your-wall beauitful). The writing was illuminating, challenging, and really made me think. The perfect combination of being visually and conceptually compelling. Beautiful, beautiful pictures. This is a very pretty book. The fields of science and stage magic are probably both better off for Carl Schoonover choosing the former, though - he's got an admirably insatiable need to tell the audience how the tricks are done. As seen in the New York Times . Carl Schoonover is a doctoral candidate in neurobiology and behavior at Columbia University, where he is a National Science Foundation Graduate Fellow.